Bottom Line:When you reach your destination observe your alpaca's behavior.They must EAT, POOP, PEE and CHEW CUD! This is for those of you, like me, who have either never transported your own alpacas, BY YOURSELF, or if you did, maybe ran short of some seemingly inconsequential item that would be worth more than gold to you at the time you discovered its absence. All the transporters I knew of were already booked. Do I panic? No way. I've been around. Should be no problem. Maybe consider the trip an adventure, kinda like an Errol Flynn swashbuckling flick- without Errol, the ship or the water. I'm tackling this mentally and doing a pretty good job with my attitude-so far. Logistics: How many miles is it? How long will it take? You're kidding, no way. 1000 miles. 18 hours of pedal to the metal. OK, let's accumulate some facts, FAST. There are many factors that can generate stress, related to the transport process, handling, loading, unloading, and removal from familiar surroundings are a few. Others are confinement, constant vibration, and the inhalation of exhaust and urine fumes. The stress combined with limited water intake can compromise the alpaca's immune system, exposing your animals to added health risks. For this reason, it is necessary to minimize the number and severity of the trips. Carefully consider time of year, route maps, places to stop with animals, car tune up, and assure that your trailer is in safe and serviceable condition. Careful planning is the key. Give your trailer a bath inside, outside, and underneath to expose any problems that might be hiding under last year's road grime and mud. Look for cracks and rusting especially where urine and dung tend to collect. Rust can make your trailer unsafe. Have your trailer inspected, or carefully inspect it yourself at least once a year. This inspection should include tire rotation and bearing lubrication. Special care should be given to your wiring system and a check of your turn, brake, and running lights. Inspect your truck's exhaust system to assure that excessive fumes are not going to get into your trailer. I'll be taking 4 animals. My stud El Patron and 3 non-pregnant females. Uh-oh. How do I avoid turning this road show into a brothel on wheels. Enter Tim Timmerman of Aussie Acres. He installed a clever, removable divider into my 2 horse trailer making it impossible for El Patron to leave his side yet allowing visual contact with the others. Keep in mind, these animals are herd oriented and find solace in each others company. There's patchy snow all over the place. Heat won't be a problem this time but can be if you don't have adequate ventilation in your vehicle. Monitor the air freshness each time you stop. Open and close doors, windows, or vents as necessary. That's standard precaution for all times of the year. Alpacas are forage eating animals and give off a lot of body heat. In summer add A/C or a blower if you can and consider doing your traveling at night if temperatures warrant it. That being said, don't dally too long. Dragging out travel time just keeps them off their normal routines that much longer. Don't judge the trailer temp as if you personally were riding back there, unless you're wearing a furry jumpsuit for the experiment. Think of being 16,000 feet up in the Alta Plano and not even a shiver. Our furry critters are tough, and much more durable than we are. For bedding, a thick mattress of good quality clean hay without seeds or other contaminants makes it comfortable for the animals and easy for you to pick their fleece out once you've arrived at your destination. El Patron is always putting his head through fences etc. so I didn't want to hang hay bags or water buckets that he could get tangled in. Add 3 more heads and 12 more feet to the equation. Well, here's the most remarkable fact and the solution to the problem. Alpaca just love to eat the hay off the floor while in their cush positions which they get into as soon as you move one inch. To make life even easier, the areas they use as dung piles are easily picked up and spreading more hay around makes it just as fresh as new. Pick up one of those collapsible rakes, they can be adjusted to any width for narrow areas and will stow easily on a wall. Don't forget a shovel. Some folks prefer the L shaped kind with a long handle so you don't have to bend down . I like the longer handled variety for the pen cleaning at the shows but on a trailer the plain old Rubbermaid kitchen type is much handier, wider and easier to control, and it stowed flat. As for food, we know where they'll get their hay. Off the floor. The rest is just as easy. Don't give pellets or grains. . I wouldn't give it during the hauling or any periods of stress (shows) anyway. Their routine has been affected and the confinement in small spaces doesn't allow much natural movement. Not a happy situation especially if you're trying to digest a big meal. Get the point. Hydration: the day before the trip make sure they've had all the water they want. . While you're moving they won't be drinking as they travel in the cush position (lying down). Be sure to stop at least every two hours and offer buckets of their home water. Water on the road may have a different mineral content and taste or smell unappetizing to your inexperienced traveler. The last thing I wanted to worry about was an animal that was becoming dehydrated because he was fussy about his brand of water. I carry enough water in collapsible jugs to handle the round trip needs and it seems to workout just fine. There was a time when I figured anyone related to a camel could go a week without water. Maybe they can in Hollywood movies, but they sure did go for the H2O on our trek. By the way, attach the bucket handle to something to keep it from tipping. A wet Alpaca is not a pretty site and water can play havoc with a perfect fleece before a halter class. Keep in mind that these rest stops are also necessary for the animals to relieve themselves. If you're transporting a nursing cria, you'll want to give the mom all the time she needs to feed her baby. Check with your vet to decide how often you must stop. Take a moment to assess the temperature and air freshness inside your trailer, and open and close doors, windows, or vents accordingly. I leave the halters on and snug in case of an emergency exit or to easily clip onto leads to unload. The less stress the better. It can be very reassuring to have an auto club membership such as AAA, so that you know help (to a vet or mechanic) is only a phone call away. Driving down a deserted road, knowing there's a town out there somewhere, wouldn't you like to know where the gas stations are located along your route AND their hours of operation. How about who has emergency service. Think that might come in handy? AAA and others can tell you ahead of time. Betcha the internet has it somewhere. Trust me on this. It will save you lots of anxiety when your needle starts dipping below the 1/4 mark. Sounds paranoid and extreme, I know. Alone on the road , dark or light, in an alien landscape with a major investment in tow, better to be prepared. Know your license plate number, also that of your trailer. Write it down inside your vehicle. When you're nowhere near you home state is not the place to find out your tag isn't current and you're being detained-under local, tribal law- not the USA laws we operate under. I don't even know if I'm entitled to my one, let em know where I am, call. Whew! Check with travel experts. Know your route. Ask for problem roads and danger areas. Learn how to use your compass and be sure it has a backlight. You'll at least have an idea of the proper direction to head in. Fuel consumption is totally mind boggling. Forget what you read on the dealers sticker as to miles traveled per gallon of gas. I'm convinced they get their results while driving downhill in overdrive. I've never seen a needle drop as fast as when pulling a trailer. I've heard that pulling using the higher octane fuel doesn't do anything special for your engine or mileage. If anyone really knows, please send me an e-mail. I just followed Toyotas' instructions and used 87. Tire pressure. My trailer has 4 tires and one unused spare. The dealer recommends I keep the pressure at 39. Check them visually on the road and also by kicking each and listening to the sound. If the sound is the same all the way around your rolling on equal pressure, a good thing. For those of you who may be tone deaf, a $1.79 pressure gauge is mucho importante. Look for a video monitor with temperature readout. I don't have the brand name but saw one at the last futurity. You can watch the animals in the trailer from the convenience of your car and monitor the trailer conditions affecting them. This could become a necessity with a pregnant female or cria in tow. Ever consider loading up before dawn, tooling down the road and being blinded by the rising sun when you came around the hill. Be aware of sunrise. Bring and wear sunglasses. You can loose control of your rig for a moment while you're eyes are reacting to the sudden change. On the subject of sunglasses. Buy the type with side shields. They'll protect you from sunrays streaming through your side windows which are very tiring and can strain your eyes adding to drivers fatigue. Remember your flashlight. Little one for your map, medium for checking out your tires, etc., big ole high beamer for searching down the road. Want to get fancy, get a night vision pair of binoculars. Where to rest. Utilize internet, knowledgeable friends and pioneers. I can recommend a book (U.S. Stabling Guide 800 829-0715) used by horse endurance riders on their treks across the country. All of these places cater to horses. Most have stalls, paddocks, available water, hay and security for all of you. Many are bed and breakfasts and are used to dealing with late arrivals and early departures of animals. I stayed at The Ranchette in Albuquerque, New Mexico. It was perfect. Janice, the proprietor packed breakfast, quiche, juice, coffee and biscuits for on the road travel plus fruit, just in case. The Rocky Mountain Training Center, in Larkspur, Colorado is a B&B for horseman and was able to accommodate my animals very safely. The hot tub, home made rolls and intrinsic beauty of the place makes it worth its own trip. Everyone loves our alpacas when they meet them. Most folks don't know what they are before that time. You must inform any of these places you'll be bringing an exotic animal and give them the opportunity to say NO. Bobbie Richine of RMTC actually was thrilled to give her horses the opportunity to be introduced to alpacas. That was interesting by itself. They ended up sniffing each others noses and taking bits of grass from her hand at the same time. Stopovers like this one add immeasurably to a trip and are the best of fatigue fighters. States have different requirements and regs for transporting animals. Have your registration papers, vaccination records and vet certificates with you. Ask for a listing of veterinarians in each state you're passing through. Check for breeders in those states also. They'll know which vets are familiar with camelids. Traveling means stress. Accidents can happen. There's no escaping it. Along with the fatigue that comes with balancing and bracing themselves in a bouncing, vibrating trailer, your alpaca might find him(her)self in an environment that is too hot or too cold for comfort, or breathing stale air in a trailer with inadequate ventilation. In addition, shipping represents a disruption of routine and alpacas love routine. Just in case, trip insurance is available. Wilkins Livestock Insurance (800 826-9441) actively solicits our business. They're also alpaca owners and understand our needs. Another is The Lone Star Agency, Inc.
Bring along your road service cards. It can be very reassuring to have an auto club membership such as AAA, so that you know help (to a vet or mechanic) is only a phone call away. BRING A CELLULAR PHONE. Make sure it picks up digital as well as analog signals. (The USA is not entirely digital at this time, and digital only phones, although less expensive while using digital service are useless in the majority of rural areas I've driven to.) If you don't use one on a daily basis, sign up for the “emergencies-only” plan. And because a dead battery is the last thing you'll need, equip your phone with a jack that plugs into your vehicles cigarette lighter. Pay attention to the road signs and know what cell phone number will get you directly to the state police. For those parts of the country with no cell service at all, a CB is a great back-up. Truckers and other road warriors use CB channel 19. Bring along your tool kit. Make sure you have a lug wrench that fits your lug nuts on your tires. They are not always one universal size. Can you turn it? If not, know beforehand and invest in one that's electric. Add all the reflectors you want. More the better. Most other drivers will anticipate one car length going through an intersection. Side reflectors will help focus attention on your trailer. Never hurts to have them on the back also. Anticipate an electrical failure or parking on the side of the road, power off. Enable your vehicle to glow. A kit with glowing cyalume light sticks, reflective triangles and a flashing light all boxed up with an air compressor can save the day. For myself, I also carry a reflective vest and cap used for bike riding and available in any sport shop. Duct tape and Velcro can be useful I'm sure but I don't know where yet. Along with other things you hope not to use are a fire extinguisher, sleeping bag, an assortment of wrenches and screwdrivers, jumper cables, fuses, and a blanket. Add a pair of gloves (to protect your hands and provide better grip on that tire iron), a sharp utility knife, sufficient leads with working clips for each animal, and some extra hay for the floor and your destination. If it's winter, head to your outback camping supplier and be prepared. Two tips: Have your own water bottle convenient to you all the time. Keep yourself alert and drink plenty of water even when you don't feel the need. Keep your nutritious snack bar, carrots, broccoli anything raw to nibble one. You can avoid feeling famished and will help to keep your blood sugar levels from getting to high or low. Any trip over an hour deserves an audio book. If you want to eat that long, boring road, rent or buy one. Libraries are letting them out now. One tip on this, if you have to concentrate on certain instructions, turn it off no matter how intense the part you're up to is. I once ended up in Wyoming while heading to Eaton, Colorado, 45 minutes out of my way. The strange thing is, I was so involved in my audio, I didn't even mind. That's scary. No one can anticipate every emergency, of course, and shipping is stressful at the best of times. But correct preparation and a knowledge that everything is as safe as it can be can add enormously to your peace of mind . A GREAT DEAL OF ENJOYMENT CAN BE GARNERED BY HAULING OUR ALPACAS ON OUR OWN. We can keep it enjoyable by having the right kind of trailer pulled by a towing vehicle with sufficient power and by providing on-going maintenance for both vehicle and trailer. Pay careful attention to weather conditions, and, the final requirement . . .drive safely. 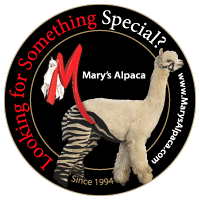 If anyone can add to this personal 'hint' list to make transporting our wonderful alpacas a little bit safer for them and for us please e-mail me at mary@marysalpaca.com. When you reach your destination observe your alpaca's behavior. They must EAT, POOP, PEE and CHEW CUD!